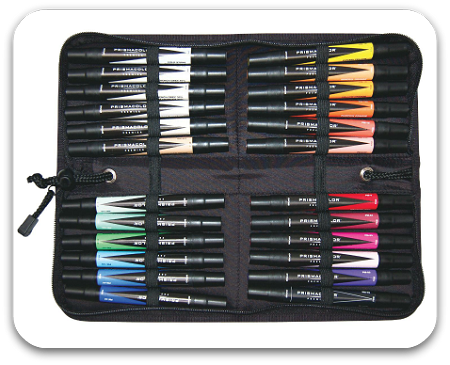 Recognized by the industry for their high standard of quality, these art markers offer an exciting array of vibrant colors. Certified as non-toxic by the Arts and Crafts Materials Institute, they carry the AP non-toxic seal. Choose from an incredible spectrum of non-fading ink colors featuring double-ended markers with both a broad nib and a fine nib and a single ink reservoir for perfect color match, end to end. Set includes: Crimson Red, Pink, Poppy Red, Orange, Canary Yellow, Dark Green, True Blue, Violet Blue, Indigo Blue, Cerulean Blue, Violet, Mulberry, Rhodamine, Sienna Brown, Goldenrod, Dark Brown, Black, Spanish Orange, Blue Slate, Grass Green, True Green, Apple Green, Tuscan Red and Peach.